So I ordered this table top sand box – in order to better understand the spatial dimensions of Japanese gardens. I do not want to copy single Japanese garden in minute detail, but rather understand how the proportions and dimensions of the design work. I also use them to better understand the levels of an existing garden or a garden I design for my clients at Dendron Exterior Design. I yet have to start to really build a garden, but I thought I’d take a few pictures of the set and the tools I use. I hope to pick up some bigger gravel stones on my next trip to the beach to use as Japanese garden stones. Sand, sandbox and tools. Gravel in different colors and grain size. A wooden knife, shaped like a butter knife that came with the box. So did the sand form. A wooden Miso spoon. A spatula, most useful for cutting straight and clean lines. 2 scrapers from the art supply store that I intended to use for gravel patterns, but that doesn’t work as I thought it would. Since the sand sticks to itself, it is easy to create slopes and valleys. It also cuts clean and nicely, which would be impossible to achieve with actual sand. Not afraid to mix with small gravel. Imagine the mess had I used play-doh! I never ordered one of those table top Zen gardens, because I was afraid of the mess they’d make. 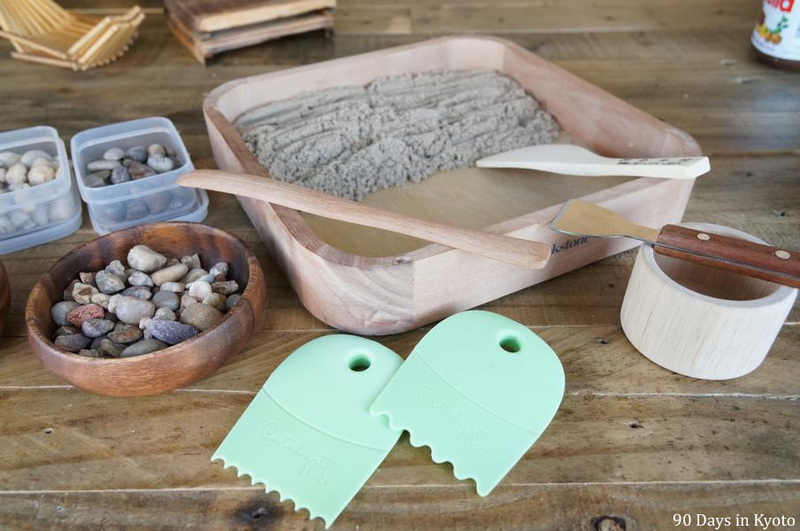 This sand (kinetic or polymeric sand) sticks to itself but not to your hands – like cookie dough. It is 98% sand and 2% polymers. Non-toxic. Smells funny, though, and washing hands after handling it is advised. Originally, I thought about buying Lego bricks to build gravel gardens, but unless I would use lots of the tiny flat grey 1×1 squares, the scale would be too big to make sense. I also thought about play-doh, too, but I am not too fond of colorful dirt beneath my fingernails. Also, I was worried it might look to childish. I was looking for an intuitive tool to work with – model building requires too much preparation for my taste. 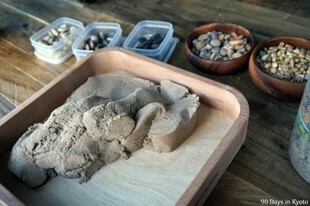 And the kinetic qualities of this kind of sand are so fascinating, it is hard to put it down. I will keep you posted about future gardens I make. Do you build miniature gardens yourself? What tools & material do you use?